This moisturizing essence hydrates and brightens your skin, and ensures that signs of aging are never seen. Submerge me provides instant relief from parched skin grief, by replenishing and retaining moisturization in your thirsty complexion. It brightens dull complexions and calms skin irritations, while reducing the signs of premature aging. submerge me was added to your shopping cart. For all skin types and all ages. 1. Use Submerge Me daily, morning and night, after toner. 2. Pump 2-3 pea-sized drops of Submerge me onto your palm. 3. Apply over your face and neck in circular motions until fully absorbed. 4. The content of the product can be used for 12 months after opening. 5. The product lasts up to 3 months until completely used. Current favourite moisturzer! I have use more than 5 of it. This product helps to moisturize and brighten my skin. The product sinks in my skin very fast without leaving any greasiness! Will definitely repurchase it again! This moisturizing booster texture is very soft and once it touch my skin is watery and become like water texture could not hold it. Applied this at night , i do not feel oily face in the morning. It hydrates and suitable for me. Really really a good product, no greasy no oily, and easy to absorb. Awesome! It doesn't make any uncomfortable on my skin even I got a very oily and sensitive skin. It will not irritated and make any clogging on my pores.Easy to absorb and really moisturizing. If your skin needs instant moisture, this is a great product. It's thin and easily absorbed and can be incorporated into your morning and night routine and under the make up. For people with drier skin like myself, more than 1 application may be necessary. I kind of wish that the moisturising capabilities is stronger for this product, but all in all it's a really comfortable product to wear. 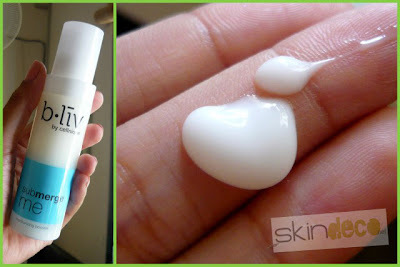 this product gave me the cooling sensation on my skin, it gives this moisturizing effect which i enjoy so much. however, my skin felt dry again the next day after applying it the night before. i guess it is my skin type which can be too dry sometimes and need several times of usage. but indeed, this product helps in short-term period for dry skin to feel moist. I fall in love with this submerge me bliv product . Feeling glowing and moisture after applying it. This product is really great! It brightened & moisturize my skin. Really love how it make my face moisturize and soft. this really moisturize my skin, but it's still feel oily on my face instead of watery feeling. However, this product is really great on dry skin. I bought it during promotion. Love the texture. I used it after Drench Me and Refresh Me. The result is amazing. My skin become much better now. I love this moisturizer a lot!! it is light weight and not oily at all. I have repurchased my second bottle!! Saw this in a magazine and try it out. The result is very good for dry skin, especially the mask. This is the second time I bought this product. I am living in Australia and every winter my forehead truns to so dry, its itchy and red. I've tried some quite famous brand and La mer, Sisley but It helped me a short period and when whether changes problems came back again. I used to buy "cosmo decorte", that saved my life last winter but it was $130+ shipping and I can only buy it from a Taiwanance online website. Now I have submerge me, I don't need to spend hips of money just for one item. I am really lucky I found this website! 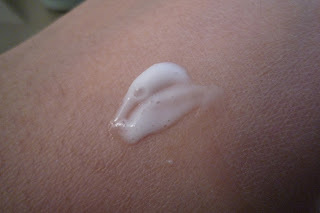 I love this moisturizer! Its light weight, absorbs fast, and does not leave you feeling greasy! Living in FL means moisturizer melts off your face with Submerge me I felt refreshed even in all the humidity! Texture like milk. Gently massage the gel into the skin. Continuously massage, then see essence penetrate into skin, absorption is surprisingly fast! Powerful hydrating for all-weather water embellish skin, and not greasy, make skin full of energy! Love this moisturizer. I tried this product for a free sample first, find it really moisturizing. Then I bought a regular size product. My skin type is extremely oily, I tried several other moisturizer before, but when I wake up the next morning, my t-zone are always pretty shining. This product gives me a total surprise. My t-zone does not shine any more, I can feel my skin more water tender, which also helps for oil control. 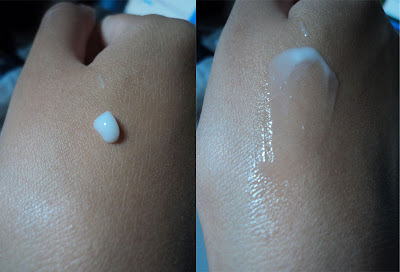 It really suits for both oily and dry skins. I just hope there is a bigger size of this product, cause it just ran out so fast. For those who have very dry skin, meet your new best friend, Submerge Me! While Quench Me is my other favourite moisturizer, I felt that it's not enough for me to use quench me as a night moisturizer. Probably it's psychological or something, but I like heavier/thicker moisturizer at night for when I sleep, since that's the time for the skin to regenerate, when you sleep... or so they say. Submerge Me feels slightly thicker and definitely more moisturizing than quench me! I use Quench Me during the day as I put on sunscreen/foundation/make up and thus using Submerge me felt a bit heavy for me. But come bed time, I cleansed my skin and applied submerge me! The formula again, feel slightly more heavy than quench me, but the brightening and the age preventing formula, coupled with its moisturizing properties quickly won my heart and made me say good bye to quench me... well, at least until the next morning! Submerge Me is a deeply nourishing moisturiser that dehydrates the skin leaving behind a smooth, soft and supple texture almost instantaneously. 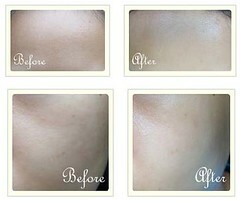 Just a single application and you would be able to experience a difference on your skin! And unlike other moisturisers in the market which feels oily or sticky, Submerge Me feels light and watery on the skin. It is an absolute must have for those with dry skin and highly recommended for dry and cold weather conditions!